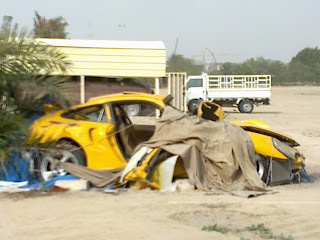 Everyday we see all kinds crashed cars sitting on the side of the road. We never know the story unless it's published in the papers. I don't know if the people here don't believe in towing? They leave cars for days sometimes months at a time. I've seen cars with flat tires just left there. I guess changing a flat is too dirty of a job for some spoiled people. They must have 2 or 3 cars at home to use if they can leave one for weeks at a time. The insurance companies here are a joke. Even if you have the "gold" package on a new car don't expect to get the right help. My mom was rear ended while waiting in a round-about sending her to the hospital and messed up her car pretty bad. After a year of fighting the other guy's insurance she got 50 kd settlement. When an accident occurs first step is to call the police which is 112 now. Then it's off to the police station for grilling. You should bring a translator if all possible, majority of the officers and investigators don't speak any English. If it's a questionable accident you will have to go to another police department for investigation. Once the person at fault is decided you will be given some paperwork to take to your agency if it's a rental car if it's a personal car you will use the paperwork to fix the car as you cannot do any fixing without proper paperwork. My husband does all the translation for me and sometimes for individuals who need help. Translators can be the thin line between freedom and jail time. 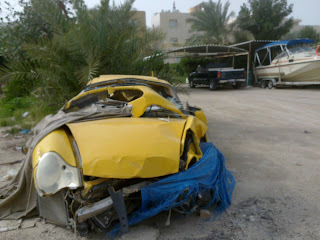 I came across a Porsche sitting in the desert and wondered why the owner wouldn't sell it for scrap, it was totalled. My husband told me that sometimes people who take expensive cars on payment can't sell it until they pay off the loan. It's not like the states when you get in an accident they will pay off your car, nope your stuck with it until you pay it off. I wonder how much money is owed on the car below? Best Advice: Try to avoid accidents at all costs. It's somewhere in the Andulous area.